George Barnard. Image available on the Internet and included in accordance with Title 17 U.S.C. Section 107. 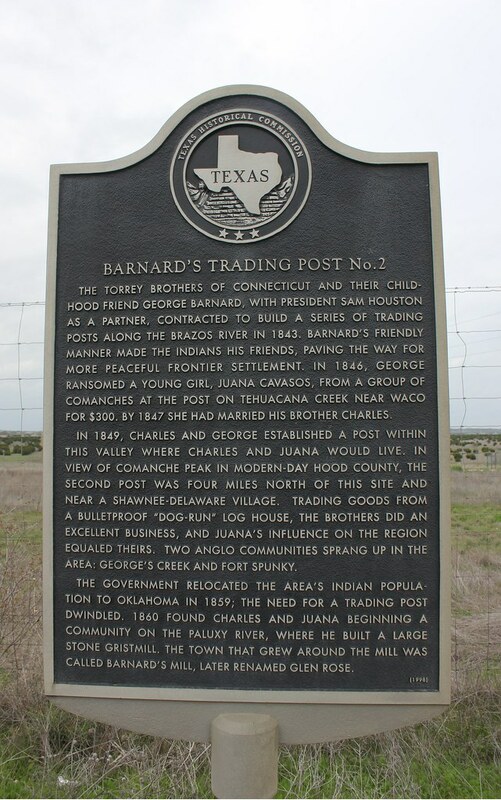 Barnard's Trading Post Historical Marker. Image available on the Internet and included in accordance with Title 17 U.S.C. Section 107. Funeral Notice for George Barnard. Image available on the Internet and included in accordance with Title 17 U.S.C. Section 107. Grave of George Barnard. Courtesy of Find-a-Grave. Image available on the Internet and included in accordance with Title 17 U.S.C. Section 107. BARNARD, GEORGE (1818–1883). George Barnard, Indian trader and pioneer merchant, was born in Hartford, Connecticut, on September 18, 1818, the son of George and Jerusha Clapp Barnard. He arrived in Galveston, Texas, in 1838 and soon moved to Houston, where he became a clerk in the firm John F. Torrey and Brothers. In June 1841 he joined Thomas S. Torrey and about 270 others in the Texan Santa Fe expedition. After capture by the Mexicans, he suffered considerably during his confinement in Perote prison. He was released by the fall of 1842 and returned to Houston, where he became a member of the Torrey firm. In 1843 Sam Houston asked the Torreys to establish the Torrey Trading Houses trading posts to help pacify the Indians of the republic, and Barnard and Thomas Torrey located a site on a small tributary of Tehuacana Creek, which came to be called Trading House Creek, about eight miles south of the location of present Waco. The site was already well known as a place where Indians and representatives of the Republic of Texas met. Early in 1844 Barnard began trading with Indians. In 1849 he became the sole proprietor of the post, and the next year he and his brother Charles moved the post to the Brazos River near Comanche Peak in what is now Hood County. They were following the Indians, who were withdrawing from growing white settlement in Central Texas. Barnard's other ventures included trade with soldiers and settlers at Fort Graham, near Whitney. He or his brother may have supplied Indians with liquor and firearms and probably did disrupt the efforts of federal agents trying to remove the Indians to reservations, a move that would have limited the Barnards' trade. In the four years immediately before the Indians' removal (1851–55), the Barnards shipped 59,000 pounds of undressed deer skins, as well as other traded goods, to northern merchants. By 1851 Barnard had moved his operation to Waco Village, where he invested heavily in land. In 1857 he sold his business to Fox and Jacobs, the town's first Jewish merchants, and entered semiretirement. He was a charter member of Bosque Masonic Lodge, begun in 1852, and was active in the local company of Texas Rangers. He married Mary Rebecca Ross, daughter of ranger captain Shapley P. Ross and sister of Lawrence Sullivan Ross, in 1850. George and Mary Barnard had twelve children. Barnard died at his home in Waco on March 6, 1883, and was buried in Oakwood Cemetery. BIBLIOGRAPHY: Pearl Andrus, Juana: A Spanish Girl in Central Texas (Burnet, Texas: Eakin Press, 1982). Henry C. Armbruster, The Torreys of Texas (Buda, Texas: Citizen Press, 1968). George Barnard Papers, Texas Collection, Baylor University. W. C. Nunn, Somervell: Story of a Texas County (Fort Worth: Texas Christian University Press, 1975). John K. Strecker, Chronicles of George Barnard (Baylor University Bulletin, September 1928; rpt., Waco Heritage and History, Fall 1971). John Willingham, "George Barnard: Trader and Merchant on the Texas Frontier," Texana 12 (1974). Dorman H. Winfrey and James M. Day, eds., Texas Indian Papers (4 vols., Austin: Texas State Library, 1959–61; rpt., 5 vols., Austin: Pemberton Press, 1966). Handbook of Texas Online, John Willingham, "BARNARD, GEORGE," accessed April 25, 2019, http://www.tshaonline.org/handbook/online/articles/fba68. Uploaded on June 12, 2010. Modified on October 4, 2016. Published by the Texas State Historical Association.